I want to personally invite you to my advanced political and cultural Boot Camp. 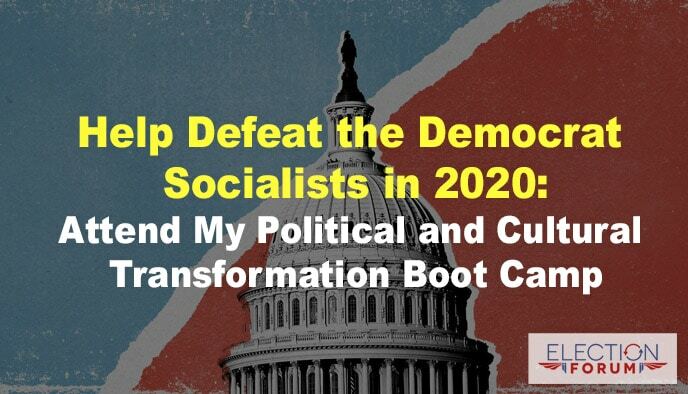 To date, the Democrat socialists have trained more than 124,000 on how to work effectively in local, state and national political campaigns. This army of 124,000 is one of the reasons Democrats have enjoyed so much electoral success, with the “blue tsunami” of 2018. This Boot Camp is devoted to training you in the strategies and tactics that can win hearts, minds and elections for the values we share. It’s going to be held on February 27, 2019 from 9am-3pm in my offices in Torrance, California … and you’re invited! You can play a significant part in this historical shift. You can help us win. And you can be part of a great movement. Call Sandra today at 310-212-5727 to reserve your spot. Or, if you can’t call her right now, email her at [email protected] so that we can hold a space for you. This is a small, exclusive event for 24 leaders, so contact us now … these spaces ARE filling up fast! You’ll have a chance to work with other like-minded conservatives, libertarians, Christians and Republicans … and learn how you can help transform America. For businesses such as Quickbooks and Unisys, I would normally charge a minimum of $5,000 for the training … but for you, there’s no cost. I’ve prepared this to be able to help you more effectively communicate and ignite change. Remember … the Boot Camp is on Wednesday, 2/27/19 from 9am to 3pm at our office in Torrance, CA. It’s concise, fast paced and action packed. If you know anyone else whom you think would be interested in coming with you, please let us know. Remember to reserve your spot now by calling 310-212-5727.